As I wrote last week, I've been working on a paper for an international conference on problem-solving courts that will take place next week in Oxford. As part of writing the paper, I've been spending some time sifting through the history of the Center for Court Innovation. Among my discoveries was a file drawer full of early press clips from the Midtown Community Court. The media coverage was almost universally positive. 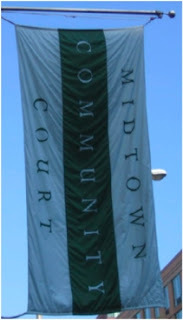 What impressed me the most was that Midtown was endorsed by the editorial boards of all of New York’s daily newspapers, from the conservative New York Post ("the proposed community court represents a creative effort to render a neighborhood plagued by petty crime both safer and more conducive to commerce.") to the liberal New York Times ("Rather than impose fines or short jail terms...the new court would sentence many [minor] offenders to useful tasks like cleaning graffiti, helping at soup kitchens or sorting trash at recycling centers. ").